The results of extensive modeling and testing, conducted by DSM Research BV, reveal the key differences in mechanics and wear of plastic gears. This paper describes the investigation of a steel-plastic gear transmission, using both numerical (FE) and analytical methods. The aim was to study the influence of the stiffness of the gear material on the bending of the gear teeth and the consequences on contact path, load sharing, stresses, and kinematics. 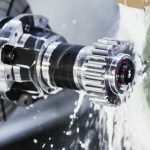 As has been shown in earlier literature, the tooth bending of plastic gear teeth results in an increase in the contact path length and in a considerable change in load sharing. The root stresses, in principal independent of the modulus, become quite different for plastic gears due to changes in load sharing. Also on the contact stresses, which depend on the modulus, the preliminary and prolonged contact-path have a big influence, inducing very high stress peaks. These peaks, due to contact of the sharp tooth tips, result in pressure-velocity values, which are up to a factor of seven higher than calculated using conventional theory. Furthermore, the FEA results show that the kinematics of plastic gears change strongly. In the extended part of the contact path the tooth tip makes a reciprocating movement on the root of the mating gear. Our hypothesis now is that this high PV, reciprocating movement is the governing mechanism of wear in plastic gears. Experimental results in literature seem to substantiate this hypothesis. Plastic gears are commonly used in today’s industry, and not only for lightly loaded applications like household appliances, tools, and toys, but also in more demanding automotive applications like electronic power steering, electronic throttle control, and starter motors. 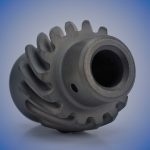 However, the fundamental knowledge on plastic gear design and engineering does not seem to have kept pace with the number of gear applications in plastics. In the 1970s and 1980s a lot of research was done, especially in Germany, on predominantly polyacetal (POM) and polyamide (PA) gears [1 to 8]. These experimental investigations focused on measuring the load capabilities for various gears under varying conditions. Typically these studies yielded curves for the normalized force versus the number of cycles to failure. In this approach the module of the gear and other geometry factors are still variables of significant influence. Relatively little attention was paid to stress analysis and wear mechanisms and how these changed under varying conditions. The standardized calculations of ISO 6336 and DIN 3990 were used to calculate indicative stresses, but it was realized that a lot of discrepancies existed between “metal” theories and “plastic” practice. 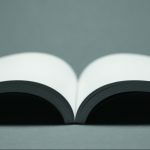 In the 1980s a specific plastic gear standard was developed by VDI (VDI 2545), and although it was withdrawn again in the 1996—for unknown reasons —this standard is still commonly used in practice. In the 1980s Yelle and Burns  conducted substantial research to give a more fundamental base to plastic gearing. In their approach they succeeded in taking into account the tooth bending of plastic gears and to calculate real contact ratios for this type of transmission. 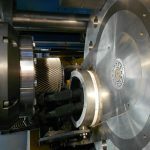 With the ongoing development of finite element software packages and improved algorithms, accompanied by sufficient computing power in the 1990s, it became possible to solve complex contact problems like meshing (plastic) gears [11 to 14]. In the group of Walton at the University of Birmingham, the experimental research on plastic gears was combined with numerical work [11,15 to 17]. They confirmed the analytical findings of Yelle and Burns by FEA and showed that load sharing changes dramatically for plastic gears. Kapelevich and co-workers used FEA to modify tooth shapes and optimize the tooth geometry specific for plastic gears . Although substantial research (both experimental and numerical) was conducted in the field of plastic gears, this does not seem to have resulted in generally accepted design rules specific for plastic gears. Today’s plastic gear designs still seem to be based on empirics, experience, and comparative calculations based on metal gear standards. The essential differences between metal and plastic gears—and how this affects kinematics, stresses, and wear issues—are still rather undefined. 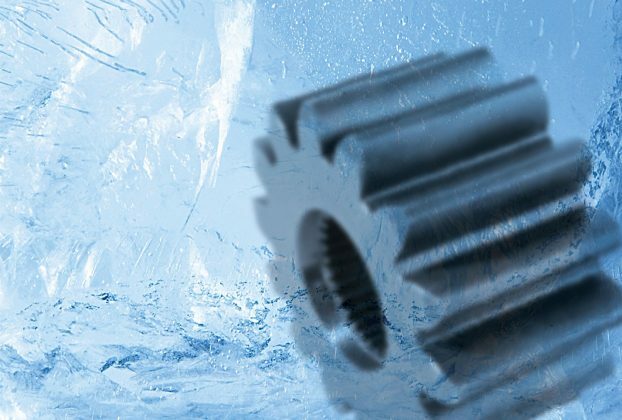 Currently DSM Engineering Plastics BV has been applying resources toward the understanding of plastic gearing as their high-temperature PA-46 (Stanyl®) has excellent wear and friction properties, which has already led to many applications in gears. In building knowledge in the field of plastic gearing, many fundamental questions were encountered. For instance, what are the differences in kinematics between plastic gears and metal gears? To what extent are the standards developed in the 1970s for metal gears applicable for plastics? 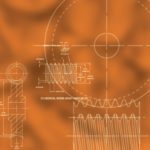 To find answers to these questions, a program to compare the results of (semi)-analytical methods (eg ISO standards, KissSoft®) and finite element analysis was started, in addition to an extensive experimental program on plastic gears. In our approach these calculations were used to study previously observed phenomena, like changes in contact path length and load sharing, but also to investigate stresses and kinematics. Finally a hypothesis was formulated on the governing mechanism of wear in plastic gears. This paper describes the results of finite element analyses (FEA) performed in order to study the effect of modulus and tooth bending on the kinematics and stresses in a gear pair. 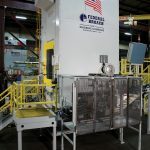 The FEA were done using a commercial FE software package, MSC.MARC. The gears were modeled as two discs with four teeth each, under plane strain conditions (2-D analysis). Furthermore around 80,000 first order quads were used, with a refined mesh near the contact surfaces, in order to capture accurately the contact stresses. Detailed pictures of the finite element mesh of the gears are shown in Figure 1. 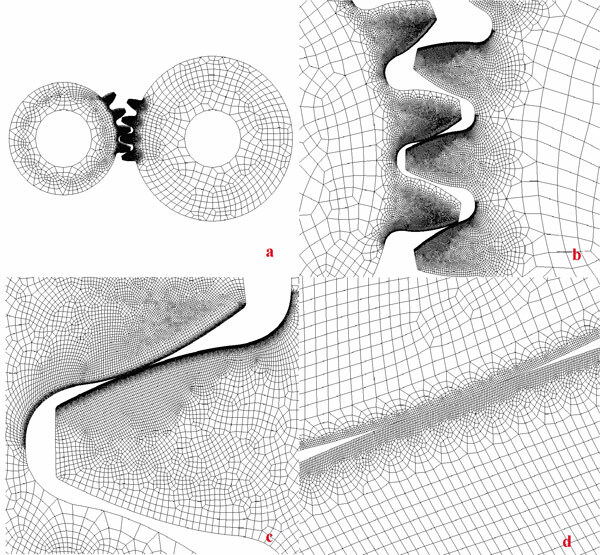 Linear elastic deformation behaviour was assumed for all materials. Although the unfilled materials do show significantly inelastic behaviour, this is expected to have only a minor influence. 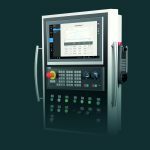 The analytical and semi-analytical calculations were done using the ISO 6336 standard (similar to DIN 3990) and KissSoft machine design program (semi-analytical). In this study the focus was on a gear transmission, consisting of a steel pinion and gear, which was made out of various materials. Both gears have a module of 2, a width of 12 and no profile shifts are applied. The tooth profile is standard according to DIN 867 with a pressure angle of 20°. Further details are given in Table 1. In the FEA, different material properties were assigned to the gears. First of all a steel gear was chosen, with the same properties as the pinion, next a glass-fiber (GF) reinforced grade of Stanyl (PA-46, 30wt% glass fiber) was selected, and finally an unfilled Stanyl, tested at either room temperature or at 140°C, was used. The relevant elastic properties are given in Table 1. 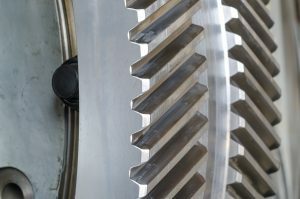 During meshing of a gear pair, the total load is shared between different teeth. Generally in standard spur gear transmissions, a contact ratio between one and two is found, meaning that for a certain part of the meshing cycle, a single tooth carries the load, while for the remaining time of the meshing cycle, two teeth share the load. Following the classical theory, for instance, the ISO 6336 standard (specific for metal gears), the load is shared according to the 1/3-2/3-3/3 rule, meaning that the load fraction at the initial moment of contact equals 1/3, increases to 2/3 at the moment the preceding tooth is leaving the contact, and carrying the full load during the period of single tooth contact around the pitch point. After the pitch point the load fraction follows the same scheme in reverse order. In Figure 2, which shows the load fraction as function of the roll angle (rotational angle of the pinion), this is represented by the dashed (theoretical) line. Using FEA the load sharing can also be studied. Our calculations and other studies in literature [11,12] show that during meshing of two steel gears, load sharing is more like a 2/5-3/5-5/5 rule, represented in Figure 2 by the black circles (E=206GPa). When a steel pinion meshes with a plastic gear, the load sharing changes dramatically. Figure 2 shows the load sharing for combinations of steel and various plastics, and the most striking change is that the load sharing becomes skew when a steel pinion meshes with a plastic gear, resulting in a load share of approximately 1/3 in the first part of the meshing cycle and a load share of 2/3 in the last part of the meshing cycle. Another significant effect is that the contact path increases, resulting in a preliminary contact earlier in the meshing cycle and a prolonged contact at the end, reducing the period of single tooth contact. This has already been reported in literature in analytical  and numerical studies [11,12]. For a glass-fiber reinforced plastic gear (E=10GPa), represented by the red circles in Figure 2, the single-tooth contact period is approximately halved, compared to a steel-steel combination. 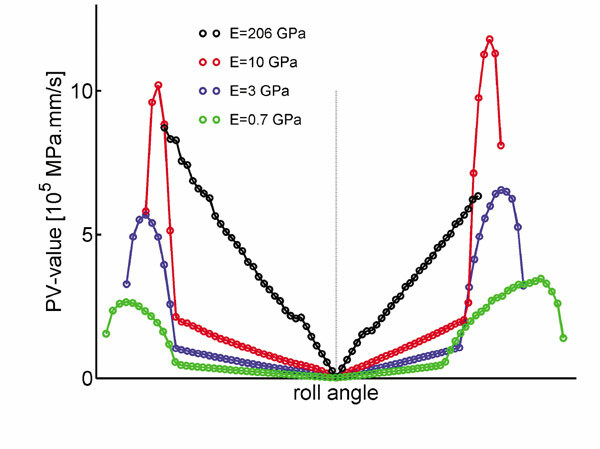 For an unfilled plastic gear (E=3GPa) and an unfilled plastic gear at elevated temperature (E=0.7GPa), respectively represented by the blue and green circles, single-tooth contact no longer occurs during meshing. With decreasing modulus the maximum load share decreases to a plateau value of approximately 2/3. The origin of these effects lies in the fact that considerable tooth bending takes place, as is shown in Figure 3. The black steel pinion meshes with the blue steel gear, as is expected based on theory, while considerable tooth bending for the red plastic gear is observed. At position “a” the red gear has a significant lag compared to the blue gear. At position “b” a lag can still be seen with the results that the red gear comes into contact with the black pinion before the theoretical point of initial contact. For position “c” the teeth of the red and blue gear are virtually at the same position. However, this tooth is the most deformed tooth, making the rest of the gear and teeth lag. At position “d” the load on the tooth reduces and the tooth bends back. Tooth bending is not solely determined by the modulus of the gear, but by a combination of stiffness (Young’s modulus) and loading. As the ratio of Young’s modulus and yield stress (i.e. loading limit) for polymers is roughly an order of magnitude lower than for steel, tooth bending plays a much more prominent role in plastic gearing. The fact that preliminary and prolonged contact takes place during meshing of plastic gears results in an extended contact path. In theory the contact path length is defined as the length along the contact line from the initial point of contact till the last point of contact divided by the base circle pitch. As can be seen in Figure 4 the theoretical line of contact, typical for involute gearing, is well captured by two meshing steel gears (black circles). A contact ratio, εα, of 1.634, derived by FEA, also agrees well with theory (1.63). 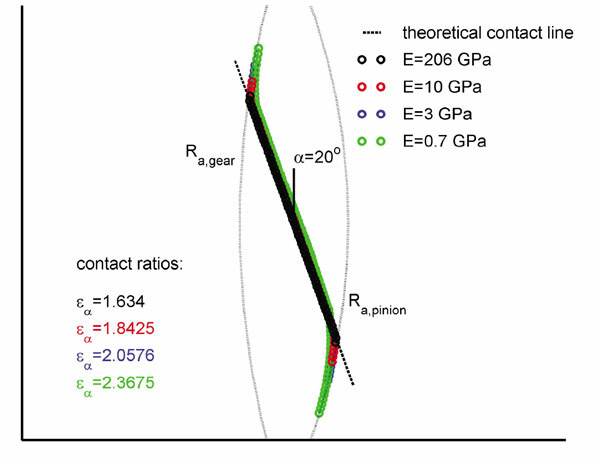 For a GF-reinforced plastic (red circles) the contact ratio increases to 1.84 and for an unfilled plastic a contact ratio two is just exceeded, which corresponds well with the fact single-tooth contact was not seen in Figure 2. For an unfilled plastic gear at elevated temperature the contact ratio goes even to 2.37. As can be seen in Figure 2, for plastic gears the contact path increases at the beginning and end. However, the extension of the contact path does not coincide with the straight contact line, but bends off. In fact, the extension of the contact path lies exactly on two circles: the tip circles of both gears. Table 3 shows the values for the root (bending) stress and the (Hertzian) contact stresses as calculated following ISO 6336 (or DIN 3990), VDI 2545, using KissSoft and MSC.MARC (maximum around pitch point). 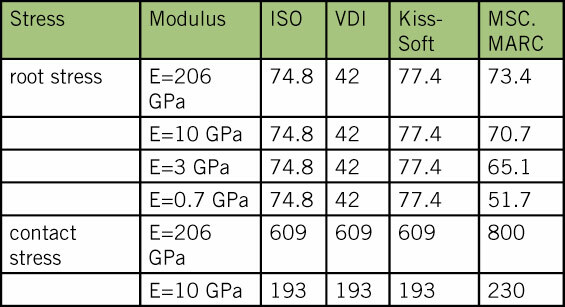 The values for steel gears calculated by ISO/DIN, KissSoft and FEA agree very well. The VDI-standard gives much lower values for the root stress, most probably because the stress correction factor, which is taken into account by ISO/DIN and KissSoft is ignored. For the contact stresses the agreement between the standards is excellent, which is not surprising as they are using virtually the same equations. Furthermore, Table 3 shows that both the root stresses and the Hertzian contact stresses decrease with decreasing Young’s modulus of the mating gear. For the Hertzian contact stresses, this perfectly agrees with theory as the contact stresses are dependent on the contact stiffness. For the root stresses, this is less evident as the stress level in theory only depends on geometry and load. Nevertheless a decrease is seen for plastic gears, which is the subject of further investigation in the next sections. By using FEA, the root stresses of a single tooth can be monitored during meshing. Figure 5 shows the root stress as function of the roll angle for a steel pinion meshing with gears of various materials. Similar regions can be recognized as were seen in the load-sharing graph of Figure 2. For a steel pinion and gear, the root stress is around 45MPa in the first part of the meshing cycle. At the first moment of single tooth contact a jump to 74 MPa is seen. With increasing roll angle the stress level lowers again as the contact point moves down along the tooth flank of the gear, reducing the lever arm. At the end of single tooth contact a large decrease is seen to some 35MPa, reducing even further towards the end of the meshing cycle. As the load fraction carried by a single tooth determines the level of the root stress, the fact that the load sharing becomes skew for plastic gears comes to expression in the root stresses. 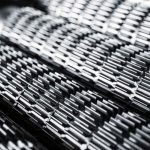 The root stresses are considerably lower in the first stage of the meshing cycle compared to steel gears, while they are considerably higher at the last part of the meshing cycle. Depending on the contact ratio and thus modulus, a period of single-tooth contact is achieved during which the root stresses become high. As can be seen in Figure 5 the level of root stresses reached in the single-tooth contact period follows the same trend as those found in steel gears. 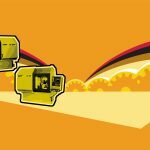 However, due to the changes in load sharing, the time span of single-tooth contact becomes shorter and the high stress level of the initial moment of contact for a steel gear are not reached. For an unfilled plastic gear at elevated temperature the peak stresses around the pitch have completely disappeared and the maximum values tend to go to a value of some 2/3 of the theoretical maximum value. It is expected that a further decrease of the modulus will not result in a further decrease of the root stress level. An implication of this lowered root stress (compared to standardized calculations) is that the gears can be loaded to higher torques than expected based on the comparison of the theoretical root stress and yield stress of the material. This does not mean that the standardized approach is fundamentally wrong, but that it should be modified by incorporating the altered load sharing due to tooth bending. where F is the force (load), Er reduced modulus or contact stiffness (see equation 2), b is the width of the gear and Rr is the reduced radius of the contact (see equation 3). where Ei is the Young’s modulus and υi is the Poisson’s ratio of the gear/pinion. where Ri is the local radius of curvature of the tooth flank of gear/pinion. The FEA results of the contact stresses as a function of the roll angle are represented in Figure 6. The contact stresses for a steel pinion and gear, represented by black circles, have a maximum in the region of single tooth contact (around 800 MPa). This agrees very well with the values that were calculated (semi) analytically. Furthermore, the local radii of curvature and the load fraction determined the course of the contact stress, as function of roll angle. According to equation 1 and 2, the maximum contact stress, occurring around the pitch point, will reduce strongly with decreasing modulus. For a GF-reinforced plastic gear, the maximum contact stress around the pitch point reduces from 800MPa to 250MPa. For an unfilled plastic gear this reduces to 120MPa and at elevated temperature to 50MPa. The values found using FEA correlate very well with the values using standardized calculations or KissSoft (see Table 4). However, as can be clearly seen in Figure 6, very high peaks appear at the beginning and end of the meshing cycle. Due to the tooth bending and the increased contact path, preliminary and prolonged contact occurs for plastic gears. At preliminary contact the tip of the gear meshes with the root of the pinion, while at the prolonged contact the tip of the steel pinion meshes with the root of the gear. This implies that it is not the involute parts of the flanks are meshing, but that the tip of the tooth, which is determined by tip radius (tip radius equals 0.1mm in the calculations), is in contact with the other tooth flank. For a GF-reinforced plastic gear (red circles) the contact of the sharp tip radius of the steel pinion and the tooth root of the gear (end of meshing cycle) results in a contact stress of 940MPa, which exceeds the values found for the steel pinion and gear. For an unfilled plastic gear the value of the contact stress reaches 500MPa at room temperature and 220MPa at elevated temperature. Using equation 1 and taking the load sharing into account, the contact stress at the prolonged contact can be estimated using equation 4.
where αls is the load sharing factor and Rtip is the tip radius. From Figure 2 it can be derived that the load share carried by a single tooth at the moment the maximum contact stress is observed is around 50 percent and hence αls is chosen to be equal to 0.5. The maximum values found by FEA and those obtained using equation 4 compare very well (see Table 4, column 3). This equation can be used to estimate contact stresses, based on geometry and loading, without going through the elaborate process of FEA. The large difference in theoretical contact stress and maximum contact stress due to the extended contact path has significant implications. In the conventional approach the maximum contact stress occurs around the pitch point at which the sliding velocity is low or even zero. The maximum pressure-velocity (PV) value, crucial in wear predictions, was found at the beginning and end of the meshing cycle. However, since the maximum value now is found at the beginning and end of the meshing cycle, combined with a larger sliding velocity (up to 20 percent), PV-values are found which are much higher than calculated based on conventional theory. Figure 7 shows the PV-values for a steel pinion meshing with a gear of various materials. For a GF-reinforced gear the PV-value is expected to drop by a factor of four, but instead a value is found which exceeds the PV-value of a steel-steel combination by 30 percent. For the unfilled materials the PV-values are about a factor of seven higher than calculated by conventional theory. The PV-values calculated by conventional theory and FEA are summarized in Table 5. It must be noted that the calculations are performed using a tip-rounding radius of 0.1mm. In case a larger tip radius is used, contact stresses will of course drop according to equation 3. In the case of a steel-plastic combination, the peak in contact stress and PV-value at the beginning of the meshing cycle (left side of picture, negative roll angles) is less important than the peaks at the end of the meshing cycle. At the beginning of the meshing cycle, the tip of the plastic gear is in contact with the root of the steel gear. 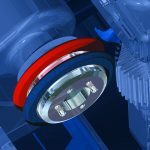 After running in, the tip of the plastic gear will probably be worn in such a way that its contact radius has become larger and the contact stresses subsequently have reduced. Apart from a lowered contact ratio, this will have no significant negative side effects. 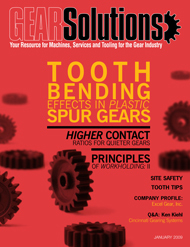 In the past sections it was shown that, due to tooth bending, all kinds of secondary effects occur in plastic gearing. Apart from an increasing contact and lowering of the root stresses, the effects on the kinematics and contact stresses are negative. As has been shown, the PV-values can become much higher due to the extended contact path, which puts the bad correlation between tribological tests (e.g. pin-on-disk measurements) and experimental wear data on gears into a completely different context. Taking a closer look at Figure 4 reveals that the extension of the contact path is perpendicular to the contact line and the rest of the contact path. Combined with the bending of the teeth, the question arises whether the involute flanks are still meshing properly. Therefore the kinematics of the meshing teeth was investigated in more detail. 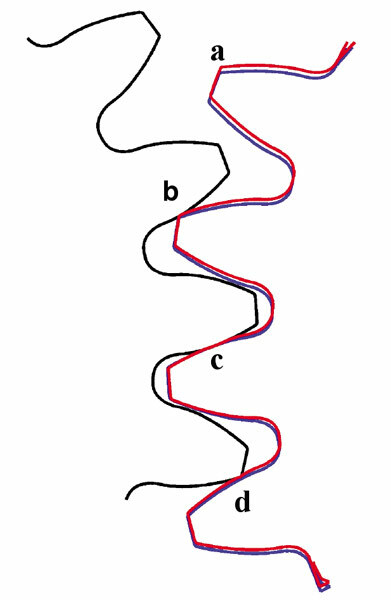 Figure 8 shows four subsequent images of the gear flank on four stages during the meshing cycle. Figure 8 shows that, at the initial contact stage, the tip of the gear flank is in contact with the root of the pinion. Although not visible in this picture, the tip (and thus tip rounding) remains in contact for quite a while, meaning that the rolling component of the velocity is very low during this stage. Therefore this stage can be regarded as if a plastic pin (or cylinder) is sliding on a steel surface. 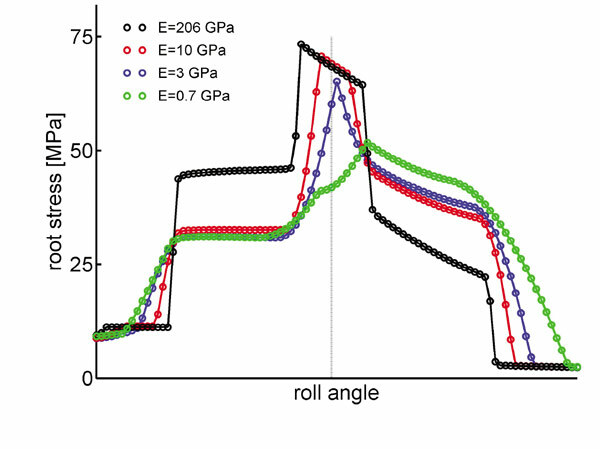 With increasing roll angle, the contact point slides along the flank as is expected based on theory. The involute flanks mesh properly and the contact point moves with fluid motion from the tip to the root of the gear (Figure 8). Figure 8 visualizes the last moment of the meshing cycle when the contact point has moved along the contact line and reached the root of the gear. After this moment, the contact point enters the stage of prolonged contact. 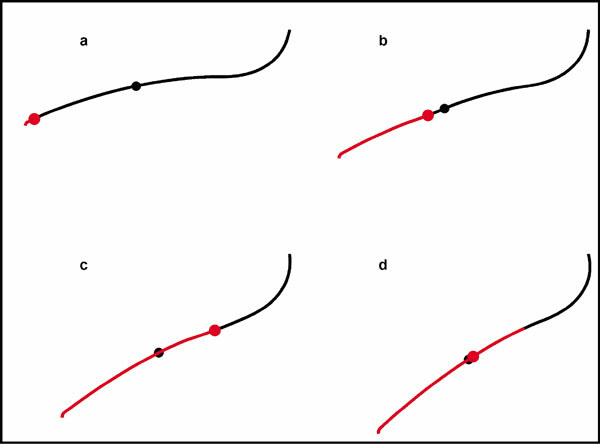 Figure 8 reveals what is actually happening in the extension of the contact path: the contact point is moving back along the flank towards the pitch point. Hence in the prolonged contact (and also preliminary contact) a reciprocating movement takes place at the root of the gear with a high sliding velocity and a very high contact pressure (and hence high PV). In the case of a steel pinion meshing with a plastic gear this is as if a sharp cylindrical, steel tip (radius of curvature equals the tip-rounding radius) is digging into the root of the gear. Depending on the length of the contact path (and thus tooth bending and Young’s modulus), the end of contact approaches the pitch point. Our hypothesis now is that this high PV, reciprocating movement at the beginning and end of the contact is the governing mechanism of wear in plastic gears. To substantiate this hypothesis, the results of experimental studies in literature were consulted. 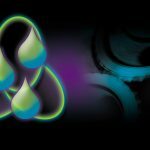 The first results investigated are experimental studies conducted by the group of Walton and Weale at the University of Birmingham, in which they performed experiments on polyacetal (POM) gears to investigate their wear behavior . Although our simulations are done on steel-plastic combinations, the same phenomena will occur in plastic gear pairs. 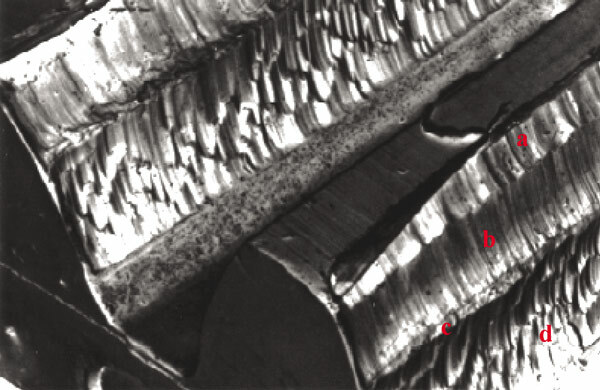 Figure 9 shows a SEM-image of the wear scar on a polyacetal driven gear, run at 1000rpm and 8Nm, after 105 cycles. In this picture four areas of interest can be recognized: (a) the tooth tip; (b) the addendum; (c) the pitch point; and (d) the dedendum. At the tooth tip, indicated by “a” in Figure 9, high wear is observed. 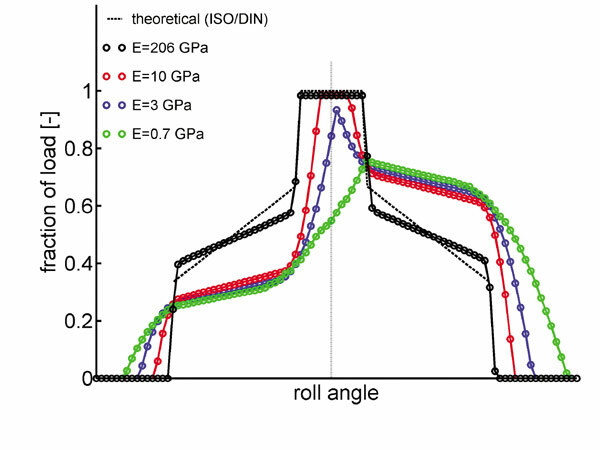 This can be explained by the fact that the tip of the gear is coming into preliminary contact with the root of the pinion, experiencing a high PV (see Figure 7, negative role angles, left-hand side). The addendum shows a much smoother wear pattern, indicated by ‘b’ in Figure 9. In the light of the simulations, in which the involute tooth flanks of the addendum are meshing properly (although still at a considerable PV), this is also in agreement. In the region indicated by “d” the most severe wear occurs and the surface shows surface pits and scoops. This is the region in which the high PV, reciprocating movement takes place, and indeed the most severe wear is expected in this area. The last striking feature is the formation of a ridge near the pitch point. This can be explained by the fact that, due to the reciprocating movement, the tip of the pinion returns at a high PV toward the pitch point. 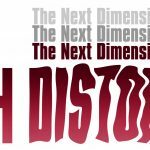 The high contact pressure digs out and deforms material and pushes it toward the pitch point. At the end of the meshing cycle the pressure reduces, leaving the deformed material on a ridge. The severe effects seen in Figure 9 are of course the result of many repeated cycles. If the mechanism described here is indeed the governing mechanism in the wear of plastic gears, it would imply that the wear scars on the pinion (driver gear) and driven gear must be different. The reason for this is that, for the driven gear, the contact point moves from the tip to the root and then moves back towards the pitch point, as was shown in Figure 8. For the drive gear, this is opposite (not shown in a picture). The tip of the gear contacts the pinion near the pitch point and moves towards the root of the pinion, pushing the material down. Next, the direction of the movement changes and the contact point moves along the contact line from the root to the tip of the pinion. 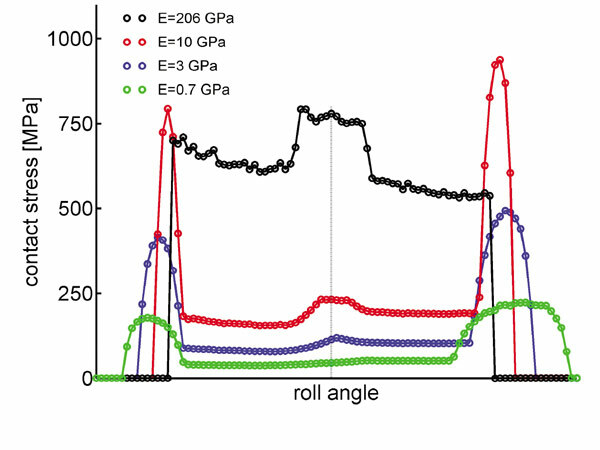 The experimental study on polyacetal gears  shows that the wear patterns at the dedendum of pinion (drive gear) are indeed very different and that a valley or depression without ridges is seen near the pitch point. Breeds et al. explained the observed differences by the fact that the surface stresses resulting from the friction forces are compressive for the driven gear while the driver gear experiences tensile stresses. The differences in wear of the addendum and dedendum were explained by the fact the directions of the rolling and sliding velocities are different above and below the pitch point. In our opinion, the rolling component of the tip of the gears in the preliminary and prolonged contact is only of minor influence and does not play a role in the mechanism as hypothesized here. Further support for our hypothesis is found in an experimental study of White et al. , in which they investigated the effect of tip relief on wear in plastic spur gears. 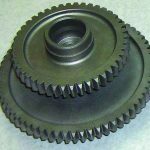 Their general observation is that tip relief has very beneficial effects on the wear performance of plastic gears and that doubling the amount of required tip relief (based on calculations) gives the lowest wear rates. Furthermore they state that the shape of tip relief is important as it determines the level of contact stress. These observations fit well with our simulations as tip relief reduces the effects of preliminary and prolonged contact. Moreover, the level of contact stress can also be considerable lowered. For instance applying a tip rounding radius of 0.3mm instead of 0.1mm reduces the PV-value by 30 percent. 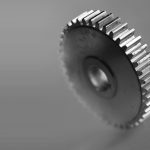 In the first part of the paper it was shown that the load sharing of a steel-plastic gear pair changes dramatically compared to the conventional theory of steel gears. Not only the length of the contact path increases, as has already been reported in literature, but also the shape of load sharing changes due to significant tooth bending. For steel-steel and plastic-plastic gear pairs the load sharing is symmetrical around the pitch, while for a steel-plastic gear pair it becomes skew and the teeth face the most severe loading in the last part of the meshing cycle (roughly 2/3 of the load). It was also shown that the extension of the contact path lies perpendicular to the theoretical contact line of involute gearing. Due to the changes in load sharing, the stresses also change. Although the root (bending) stresses are only dependent on load and geometry, due to the changes in load sharing the bending stresses decrease for plastic gears. Also here a plateau value of roughly 2/3 of the theoretical root stress is predicted. With decreasing modulus the contact stresses around the pitch point become lower, as expected based on Hertzian theory. However, due to the extended contact path the tip of one gear comes into contact with the other gear, resulting in very high contact stress peaks. As a result the PV-value can be up to seven times higher than predicted in theory. In the preliminary and prolonged contact, the involute tooth flanks do not mesh properly, but the tooth tips make a reciprocating movement on the root of the other tooth. We state that this high PV, reciprocating movement of the tooth tip is the governing mechanism of wear in plastic gears. Experimental observations in literature substantiate our hypothesis. is a senior research scientist at the Material Science Centre of DSM. He is also a member of the Global Segment Team Gears of DSM Engineering Plastics, a team leading the development of Stanyl gear applications. He joined DSM after studying mechanical engineering at Eindhoven University of Technology and receiving his doctorate in 2002 in the field of polymer mechanics. To learn more go to [www.dsm.com].